Junior world’s team member Jessica Mundy is the recipient of the eighth Amy Gillett Cycling Scholarship, delivered in partnership with the Amy Gillett Foundation, Cycling Australia, the Australian Institute of Sport, Phil Anderson Tours and Hydralyte Sports. The 18-year-old South Australian will now become an official Ambassador for the Amy Gillett Foundation. In honour of Amy Gillett, the Scholarship not only lauds sporting talent, but broader developments such as schooling, career aspirations and community participation. This Scholarship offers a unique opportunity to assist Australia’s talented up-and-coming women road cyclists by providing national and international competition and training opportunities. AGF Patron Simon Gillett said “the scholarship provides an important stepping stone as evidenced by previous recipients’ history winning world championship medals, national titles, and securing professional contracts”. Jessica is a determined young athlete who has already experienced two years of international competition. Much of Jessica’s training and racing has been as part of the South Australian Sports Institute and the Jayco/Apollo VIS team for the National Road Series. CEO of the Amy Gillett Foundation, Tracey Gaudry is delighted by the choice of this year’s recipient and believes Jessica is now ready to take the next step in international senior competition. “The Foundation received applications from many very promising female cyclists, all of whom would be worthy recipients of the Amy Gillett Cycling Scholarship. This year we have placed a focus on development. Through the Scholarship, Jessica will take her first steps in the elite international ranks on the path to what we hope becomes a successful road cycling career”, enthused Gaudry. Jessica was extremely excited when told she was the successful applicant “I was overwhelmed when I received the news. I am really looking forward to being an Ambassador for the Amy Gillett Foundation and with that having the fantastic opportunities it brings”, said Mundy. Jessica commenced cycling as an eleven year old with the Norwood Cycling Club and in the past seven years has progressed through State, National and International competitions. 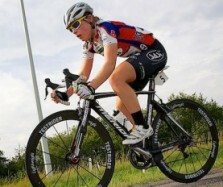 “I one day hope to join an international cycling team such as Orica-AIS and to compete on the UCI women’s tour”. AIS visiting scholarship during training camps at the AIS and while overseas. The Amy Gillett Foundation was established in 2005 following the death of Amy Gillett while cycling with the Australian Women’s Cycling Team in Germany, when a driver careered across the wrong side of the road into the riders.